In 2016, Design Impact led an inclusive community engagement project in Walnut Hills. This work, developed in partnership with the Walnut Hills Redevelopment Foundation, LISC of Greater Cincinnati/Northern Kentucky and United Way of Greater Cincinnati, looked at how artists and residents can work together to engage residents who aren’t typically involved in shaping the future of the neighborhood. This project ran from fall 2015 to fall 2016, ending with the launch of High Fives, a short project created and led by residents. The following photos capture a series of engagements with Walnut Hills residents from May 2016 to November 2016. Read more about the project in our latest case study. Residents met over two days to generate new ideas on different opportunities for change in Walnut Hills. 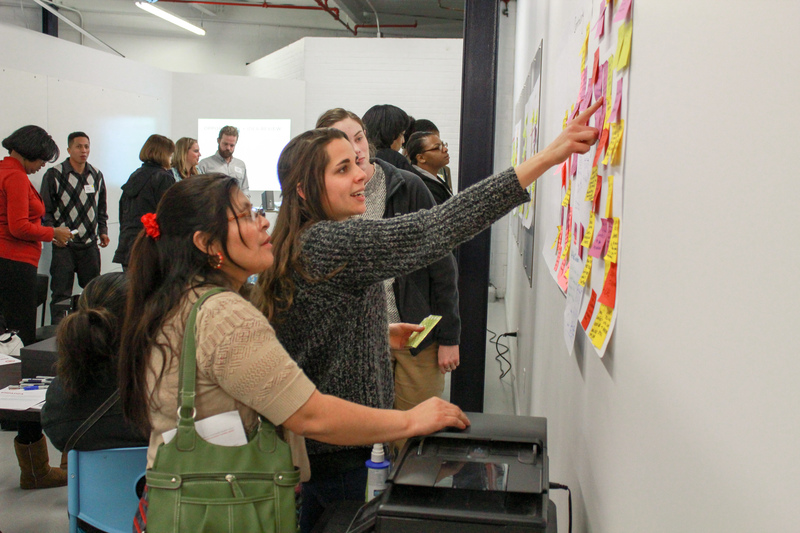 After generating hundreds of ideas, one concept was selected to try in the neighborhood. The idea, High Fives, encouraged residents to celebrate each other through fun, creative yard signs. Residents could pick up their signs at the local library or recreation center, fill in the sign with a positive message and place it in the lawn of their neighbor. Community organizations saw High Fives as a fun, creative opportunity for residents to lead a project that would connect their neighbors. Barb Thompson and Alicia Spivey share ideas on how the neighborhood can encourage a culture that cares for all of its residents. Neighbors met over pizza at Bush Recreation Center, a community hub. Fred Orth and Kevin Wright from the Walnut Hills Redevelopment Foundation share ideas on inclusive economic development opportunities in Walnut Hills. Longtime resident George S. listens to Evelyn D., who had recently moved back to Walnut Hills, during conversations about economic development. The Walnut Hills Redevelopment Foundation saw their neighborhood Street Food Festival as a perfect opportunity to test the idea with community. Rather than launching a full-scale version of High Fives, they set up a booth at the festival to see if people would be open to experimenting with creative ways to interact with strangers. Despite looming clouds, hundreds of people gather at the Walnut Hills Street Food Festival. The festival draws a wide and diverse crowd with a mix of food trucks, music, art and family-friendly activities. Aprina Johnson of the Walnut Hills Redevelopment Foundation welcomes visitors to the High Fives booth. The RF and Design Impact designed the community engagement session – disguised as a fun, interactive art-making tent – to inspire conversation and connection. A large-scale map of Walnut Hills. Festival-goers could place notes on the map that described what they would celebrate in the neighborhood. Ashley places a note for “Kroger’s” on the map. Several residents who spoke to Design Impact during the project expressed the grocery store chain’s significance in the neighborhood. Kroger closed its Walnut Hills location in early 2017. At this time Walnut Hills does not have a grocery store. Visitors to the High Fives booth are asked to draw a prompt from the basket. Each slip of paper described an act of kindness for a stranger. The High Fives booth at the Street Food Festival was a great opportunity for the RF to meet new people who were interested in doing more activities that could bring Walnut Hills together. 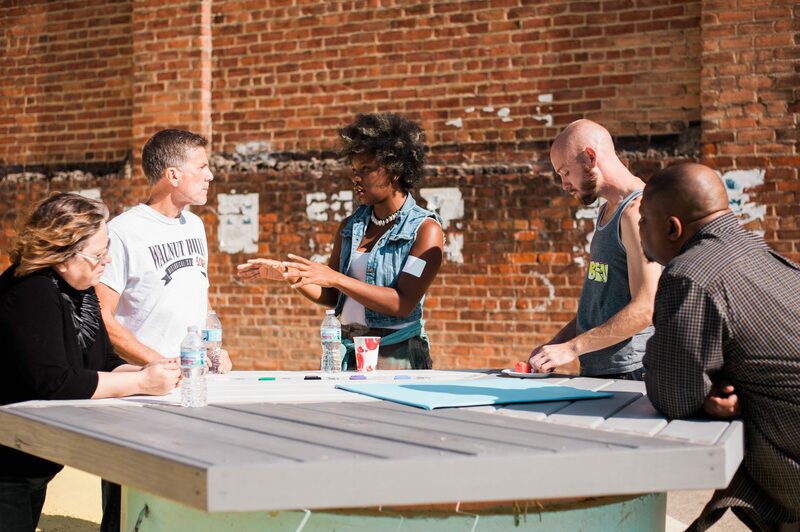 A few weeks later, the RF and Design Impact hosted a design session in St. James Pocket Park to plan High Fives. Ashley and Earth enjoy the unseasonably warm weather on an October afternoon. Ashley and Earth had never helped organize an event with the Redevelopment Foundation before, but had been invited after stopping by the High Fives booth at the Street Food Festival. Gary Dangel, a longtime resident who had participated in earlier brainstorming meetings, sketches ideas for the High Fives signs. Themes of love, connection and Walnut Hills’ tagline, “We are Walnut Hills” are captured in initial sketches. Once the vision for High Fives was decided, staff from Walnut Hills Redevelopment Foundation helped resident leaders put the plan into action. Residents kicked off High Fives with a sign-making event at the Bush Recreation Center. People gathered to fill out their signs, then walk around with the group to place their signs around the neighborhood. A young boy filled out a sign for Bush Recreation Center. His friends stood next to him proudly listing all the reasons they liked the rec center as he wrote them down. Ashley, one of the organizers of High Fives, filled out her sign for Ms. Pam. High fives for High Fives in front of the Bush Recreation Center. High Fives could not be possible without the initial vision and support of LISC of Greater Cincinnati/Northern Kentucky and the United Way of Greater Cincinnati. All photos taken by Design Impact.